I HAVE BED BUGS!!! What do I do now!? Don’t hesitate! Call us today for a FREE consultation at (520) 579-1701! We can come out to your residence and confirm the presence of Bed Bugs, at which time the inspector can present some treatment options at your request. What was once just an innocent children’s rhyme but a couple years ago, is beginning to ring true for households all over the United States…again. Bed Bugs have been dated as far back as cavemen, first feeding on humans in caves that we shared with bats. As time went on we just lived with them killed them here and there but never got rid of them, much like the nuisance of mosquitoes. This continued all the way up until the end of World War II at which time DDT was invented, and so was Chlordane shortly after that. The effectiveness and long residuals of these solutions made them household items…one customer still in the mindset, had a jar of chlordane stored under her kitchen sink to this day! There are even first hand stories of people growing up watching their mother run around the house spraying anything that moved with a metal canister filled with DDT. The widespread use of both these materials were the being used for residential, commercial, and agricultural across the U.S. Several years later Bed Bugs were but a memory, they had pretty much disappeared from America. Decades later the effects of DDT in the environment was becoming apparent and in 1972 the use DDT was banned from the United States. In 1983, Chlordane for pest control use also saw its final days. At this point the sentiment that the broad general use of pesticides was in no way good started to spread. In the industry we use the term “action threshold” this is the point at which a pest can’t be tolerated any longer, for whatever reason some action needs to be taken against them. So we saw people’s “action threshold” become higher as they would wait until absolutely necessary before introducing chemicals to control the situation. In the structural pest control industry we started to sense this early on as the manufacturing side started creating a whole new class of chemicals based off of Pyrethrum plants. These chemicals known as Pyrethrins or Pyrethroids, depending on which way it is made, makes up most of the pesticides used today, including the ones bought at your local hardware stores. These chemicals have very low toxicity to mammals and dissipate quickly if introduced into the environment. Also as part of the problems were irresponsible use, our industry also started using different treatment techniques. The most popular of the techniques being the change to “exterior only” pest control, spraying the interior locally only when a problem has presented itself. These new materials as well as new techniques have helped us make great strides in controlling the pest populations around homes while also protecting the environment. Unfortunately, in the 21st century international travel started increasing, as well as a new global economy started to emerge. The United States was seeing more goods and products being imported than ever before, even our own products were being assembled elsewhere then shipped back. Soon the Bed Bugs started making there way back…unfortunately the chemicals and techniques that once fought off these blood suckers were gone. Any chemical that once was applied to the inside of houses gone. Worst in our urban areas, populations were at the highest level they had ever been. People had no choice but to share these hitchhikers and so they flourished. For several years we as an industry were losing the battle. New generations of Pest Control Operators whom received zero training regarding bed bugs, treatment techniques that seemed to work for other insects didn’t stand a chance. Most of the chemicals were so low in toxicity the Bed Bugs were breeding quicker than could be killed. We were in a panic, but with new chemicals, new training, new techniques and a lot of trial and error we have managed to stop the spread. We will always have to deal with these “new” insects, they are here to stay. As time goes on education will be the key. Knowing what to look for will go a long way, this will prevent them from being brought into the home or if they do get introduced into the home, at least it will be recognized early on and dealt with quicker and easier. At Gecko we have established two different methods to controlling these insects, which one you decide on will depend on a number of different circumstances. The first option is a Liquid Residual Treatment. 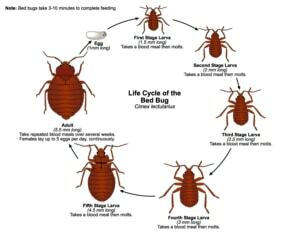 Bed Bugs will hide anywhere 2-20 ft. from where they can access a “blood meal” which is you or someone in your household. The focus of this treatment is to treat all these areas, as well as areas that we have known them to hide in the past. We use materials that are labeled to be used on and best suited for these areas. A list of areas that are treated can be found below in the sample of our “Bed Bug Treatment Report.” These areas will have to be prepared for treatment using the “Bed Bug Preparation Sheet“. Also a major part of this type of treatment is laundry, as we can not simply spray clothing. All clothing must be washed in the hottest water possible and dried in the dryer for at least two cycles. The heat will help eliminate any insects or eggs on the articles of clothing. We understand that some articles of clothing are too delicate to endure this procedure so we have a “Bed Bug Laundry Guidelines” sheet to offer some other options when it comes to eliminating these insects from your clothing. The second option is a Whole House Fumigation using Vikane gas. The first step is draping tarps from the roof down to the ground, then we roll and seal the edges of the tarp to encompass the house in a tent of sorts. Once this is complete we introduce Vikane gas in to the structure. This gas will equalize in the structure and sit overnight so we obtain the proper exposure time. The next morning we remove the tarps and the gas dissipates. As Vikane gas breaks down in the environment and is not a greenhouse gas it causes no harm. As we finish putting all the tarps away we measure the house ensuring that it is safe to re-enter the structure. The best part about this treatment is there is minimal preparation involved with it, no laundry, no emptying drawers, you just need to vacate the house during the treatment along with any pets you have. The only preparation required is food and some personal hygiene products need to be doubled bagged in special bags or removed from the structure altogether. You can find a sheet provided by Dow Agro Sciences regarding what needs to be bagged or removed here in “To Bag or Not to Bag” . As these insects are natural hitchhikers and we want minimize the risk of re-infestation after the treatment, we require that you take only one change of clothes per person and all luggage remain in the house. If the preparation involved with Option 1 sounds too daunting, too time consuming, or just plain too much of a hassle then Option 2 might be a better option. Keep in mind that both of these treatments will include weekly follow ups to make sure all activity has ceased. Once you the homeowner as well as the technician are both confident the treatment has been a success and no evidence remains a 3 month corrective treatment guarantee will be placed on the house. This means that should the presence of any remaining Bed Bugs be detected we will correct the issue at no extra charge to you. At this point you will want to educate yourself as to what to look for so you do not re-introduce them back into your house also trying to figure out how you got them in the first place so you don’t let it happen again. If re-introduction does occur after the 3 month guarantee, due to the nature of these insects, it is deemed a new infestation and the whole program will have to be initiated all over again.